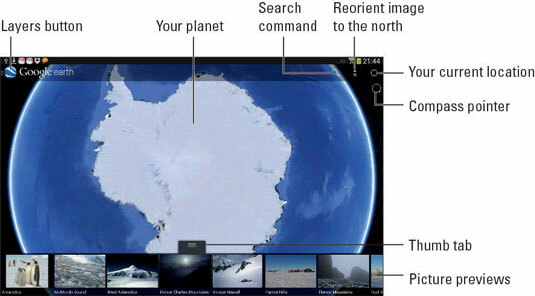 The Google Earth map is similar to the Maps app on your Samsung Galaxy tablet, except it covers the entire planet. And while you can get around and explore your locale or destination using the Maps app, Google Earth is more of a look-and-see, interactive world atlas. To run Google Earth, start the Earth app, found on the All Apps screen. You can also find a shortcut on the Maps app sidebar. If Google Earth isn’t installed on your tablet, then you can obtain the app from the Google Play Store. The Google Earth interface has features similar to those in the Maps app but is customized for viewing the globe. The best advice for using the Earth app is to explore: Drag your finger around the screen to pan and tilt the globe; pinch and spread your fingers to zoom out and zoom in, respectively. You can use the Search command to find things. Items on the Layers sidebar are used to show or hide map details. Use the thumb tab to slide the picture previews up or down.